Lisa Gercie’s gifts have brought joy, healing, and peace to her clients. Here are their stories. I went through a period of four years where I was full of stress, fear, and anxiety. Truthfully, I was on the verge of depression. From the moment I walked into Lisa’s office I felt an instant calming, yet energetic energy wash over me. Through Lisa’s hypnotic healing sessions and her guiding light, my life evolved into nothing less than joy, security, and abundance. I have found and married my soulmate, repaired relationships, found the career of my dreams, and I now exude self-confidence. Lisa has worked with me to find my purpose in this world. I was also fortunate to connect through hypnosis to my late grandmother and uncle. Both losses were devastating to me. Lisa helped me find my inner strength and a sense of peace. I am eternally grateful as she helped me to overcome my internal blockages and I was able to heal on the deepest level. I am full of love & light. — B. When I first met Lisa, I found her to be so open and cheerful with such a positive energy. She just draws you in and makes you feel comfortable and uplifted as soon as you see her. I find that she has created such a serene and calm atmosphere that makes you feel as if you have stepped into a world that is both safe and relaxing the minute that you come into her sacred healing space. I also found her healing powers to be amazing! I have suffered with sinus problems for many years and through Lisa’s hypnotic healing session I have been breathing better and the sinus headaches have disappeared. — E.
I was putting my intention out into the universe to find a spiritual healer. I am a spiritually tuned person and had been doing years of my own inner work already. One day I had heard about Lisa as if by synchronistic magic. I knew I needed assistance to release some trauma/stuck energy. I needed to reach a deeper level of healing than my regular meditation could seem to provide. With my first healing session my chronic pain that I have had for three years which was usually an 8 to 10 on the pain scale, is now a 1.5 to 2 tops. The pain seems to continue to be lessening as the days go by. Elated by this alone, it took me days to realize I also have less anxiety as well! Plus a deep lasting calmness I can’t even describe. I can only assume it was the Archangels and Lisa’s healing gifts that calmed my soul and took the useless stuck energy away. I’m eternally grateful to this amazing healer. Thank-you Lisa and love & light to you! — D.
Lisa has devoted her life to personal growth and service to humanity. She had assisted me in transforming and shifting my life through her hypnotic healing sessions. As soon as you walk into her healing suite you have this sense of calmness. Lisa has a unique and warm approach and makes you feel right at home. She brings a down to earth approach as well as her honesty and sincere desire to provide me and her client’s with the best healing and results possible. She is caring, compassionate, and sensitive to the needs of others. As soon as my healing session began I could feel the presence of the angels. I then felt this heat in my chest, something that I had never felt before. My chest visibly looked like I had a sun burn after the session. That night my boyfriend drove me home after my session and I felt that I had an out of body experience. Before this healing session I was feeling very bloated and had terrible night sweats. I have not felt bloated or had a night sweat to this day. I am truly convinced that Lisa’s healing gifts have healed me. If there is any injury or healing needed, Lisa’s hypnotic healing sessions can be life changing. — L.
I had a bad case of eczema in both of my ear canals. I have had this problem for the last six years. During my healing session I could feel the healing spirits and angels working on my head and ears. “It was intense,” are the only words I can use to describe the feeling. Since my healing, I have not had eczema in either ear canal! — T.
I would like to extend my gratitude to Lisa. With her guidance and knowledge I have been able to overcome many hardships in my life from a traumatic car accident to every day stresses. I also tried a hypnotic healing session and was able to connect with a special family member, my aunt that had passed from brain cancer. I have always felt enlightened and relaxed after leaving Lisa’s. She has a sweet nature and calm demeanor and makes it very easy to talk as well as be open with her. She is one of the warmest, understanding, and accepting people I have ever known.– A. My first healing session with Lisa was the most eye opening spiritual experience I have ever had in my life. 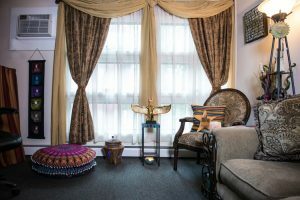 When I walked into her healing sanctuary I immediately felt comfortable. The aroma was so calming and the room was filled with such positive energy. I wanted a healing and to connect with my brother-in-law who had passed in 1993. I was on the healing table and she talked me through the relaxation process. I got into such a relaxed state so quickly. I started talking (in my mind) to Larry, my brother-in-law. Several minutes may have gone by and I kept saying his name and asking him to connect with me. Through this I noticed that my right hand was elevated. I consciously put it back down and continued trying to connect with him. Before I knew it my right hand was raised again, I knew at that moment that Larry was holding my hand and telling me he is ok and is always with me. I was still on the table in the relaxed state and could feel this unmistakable surge of energy pulsating through my body. It started in my head and flew out my fingertips. It was warm and comforting and I knew the angels were there with me, healing me from the inside out. The healing that Lisa conducted took all the burdens of guilt, self-loathing, and insecurities that I have lived with for so long, away. I truly believe that I was able to forgive and be forgiven during this spiritual session. I also saw Archangel Zadkiel, the archangel of forgiveness. Yes, I actually saw his face. I am so grateful for this experience. — S.
I went through a five year period of my life that was extremely traumatic and trying. My dad and nephew died, I got divorced, and almost lost my employment. Naturally this engulfed me to a very dark place where I felt I would never truly come back from. Lisa has been a huge part of me surviving these traumas. Lisa’s coping techniques and her spiritual healings have helped me to have the hope, desire, and will to enjoy life again. The hypnotic healing sessions have helped me with having faith in the power of my angels and has assisted me in getting my life back on track again. I know I was healed physically, spiritually, and emotionally by a power greater that can be explained in words. I have complete faith again. — K.